Raring Ringtail for Ubuntu desktops and servers now ready to download. The stable release of Ubuntu 13.04 became available for download today, with Canonical promising performance and graphical improvements to help prepare the operating system for convergence across PCs, phones, and tablets. Named “Raring Ringtail,”—the prelude to Saucy Salamander—Ubuntu 13.04 is the midway point in the OS’ two-year development cycle. Ubuntu 12.04, the more stable, Long Term Support edition that is supported for five years, was released one year ago. Security updates are only promised for 9 months for interim releases like 13.04. Support windows for interim releases were recently cut from 18 months to 9 months to reduce the number of versions Ubuntu developers must support and let them focus on bigger and better things. The 14.04 release planned for April 2014 will bring another Long Term Support edition and convergence across PCs and mobile devices. The plan is to let the same version of Ubuntu be installed both on traditional desktops and mobile devices but present different interfaces depending on which device it’s being used on. Developer preview versions of Ubuntu Touch can be installed today on some Android devices, but the desktop and touch versions will remain separate code bases until 14.04. 13.04 contains a couple of goodies for developers who want to get ready for Ubuntu’s converged future. There is a Developer Preview SDK for developers who want to build applications that can run across both desktops and mobile devices. 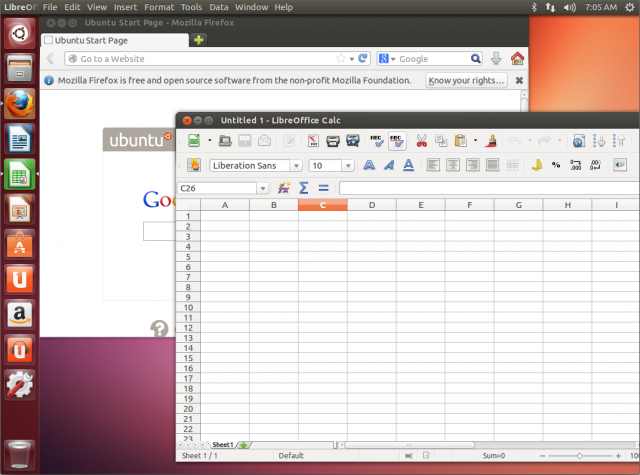 There is also an option to install MIR, a new display server that will eventually replace the X window system in Ubuntu. Canonical founder Mark Shuttleworth also described MIR this week in an interview with Datamation. X is still driving today’s versions of Ubuntu, but “at some stage we’ll slip MIR in underneath X and everything else,” Shuttleworth said. “What MIR does is it gives us kind of unified wrapper around OpenGL drivers from all sorts of different places.” MIR will make it easer to run Ubuntu across different types of chips, he said. 13.04 brings some changes to Ubuntu’s Unity interface, including window snap animations, new preview animations in the Dash, a new Ubuntu One sync menu, a photo lens in the Dash for easier access to photos, and new window switching methods. OMG! Ubuntu! has a great roundup of these changes to Unity. One recent change to Unity that might be disconcerting to users is the elimination of workspaces, or different desktops, in the default configuration. Enlarge / “Enable workspaces” and “Add show desktop icon” are left unchecked by default. If Unity’s not your thing, there are plenty of alternatives. Beyond the desktop, Canonical released Ubuntu Server 13.04 today as well. The new server edition includes high availability capabilities for OpenStack, the open source cloud-building software. Canonical recently struck a deal with VMware to integrate OpenStack-based networks with VMware’s server and network virtualization software. As a result, Canonical and VMware will provide joint support to customers. Canonical has also upgraded its Juju DevOps platform, which helps deploy workloads to Amazon, OpenStack, and other clouds.